Pressing my nose against the glass (where allowed!) to watch those mammoth-sized machines takes off, rubbing shoulders with people from different corners of the world, window shopping and grabbing hot meals before boarding a flight are just some to the things I enjoy when spending time at an airport during a layover. A few of my friends tend to stress over “what will I do at the airport for such a long time!” Not me. 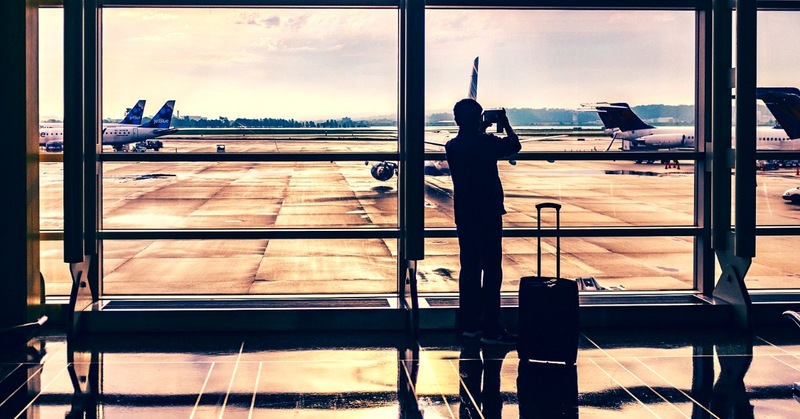 Over the years, I’ve come up with some alternatives on how to pass time at the airport – some of these are from experience and some came in the form of suggestions. Take a pick on which you would choose for the next transit time. Depending on the time in hand, explore each and every inch of the airport so that you can write a guide that is useful for the rest of us. Learn more about the world by noting the names of destinations on the digital announcement boards. There’s a whole new list of places to add to your travel list right there! If you haven’t had time to shop for souvenirs, walk into the duty free for some amazing deals and interesting gifts. And don’t forget to buy those huge bars of chocolate that seem to be available only at airports. Catch up on your sleep. You might think it looks strange, but it is simply not, to stretch out on a series of seats as long as you are not causing inconvenience to fellow passengers. Ensure that your carry-on luggage is secure under your head or locked to your seat. Bigger airports even have quiet lounges for a reason. I’ve been told by some that they even get in a bit of exercise at the airport – do their stretches, bends, shakes and lunges. I personally feel walking around the airport is exercise enough. If the break is on the way to your destination, utilise it to plan your trip. Read – not just on a kindle and not the newspaper. Take the time out to start that book lying in your bag for times like these. Step in an airport spa and get the much needed massage, manicure or pedicure. Of course you need to spend some money on that but hey, it’s for you! People watch and spin stories. I love watching people around me and make up background stories with them. This is a fun game when you’ve got company too. Make your shopping list at the airport stores. It’s a habit for me to indulge in window shopping at the airport – I also jot down or click photographs of things that I like and then buy them online when I see the word ‘sale’. Strike up a conversation if the person seated next to you seems keen on it too. You would learn several interesting things from these conversations. And no, you do not necessarily need to ask their name. Make your to-do list. By the time I am at the airport and heading home, my head is buzzing with the things I want to do once back. So rather than lose a thought, I make a list and pin it up on my work board as soon as I am home. Freshen up. Having experienced the annoyance of having a connecting flight cancelled and being stranded in a hotel room overnight sans luggage, I have developed the habit of carrying a set of nightwear and a set of clothing in my carry-on. If time permits and need be, I’ve used the airport amenities to freshen up and feel human before venturing out to explore. We are all aware of the amazing nature of airplane food, right? Take some time to tuck into a good meal at the airport. And if you are going to be in the plane for a long time, pick up some snacks to tide you through. Layover means sightseeing – period. Free Wi-Fi is available at almost every major airport now. Log in with different IDs to stretch out the free connection. Bloggers and photographers! The transit time is perfect to click photographs to be added to your personal collection of stock photos. Take some time out to edit the photographs on your phone. Then when you want to upload them to social media or share them, you will have edited photos. Carrying your laptop? Catch up on that last bit of office work so that the slate is clear when you are back in office. If you are the kind that loves games, make sure your gadget is charged and uploaded with the games. Go ahead and notch up those coins and move to the next level. Watch all the videos that you’ve saved across social media but never had the time to see. Learn something new. As a budding home baker and food blogger, I’ve spent hours scrolling through videos that teach me something new about food and baking. Not a savoury thing to do but if sifting through social media friends is on your to-do list, now is the time. Update your journal. And if you don’t have one, there’s no better time to start than in the anonymity that the airport provides you. What are the other interesting things that you’ve done to pass time at the airport? Do share in the comment section below. If you like what I’ve written and would like to read more (I hope you do!) then hit the subscribe button. Or you could follow me on Instagram, Facebook, Pinterest, Snapchat or Twitter.